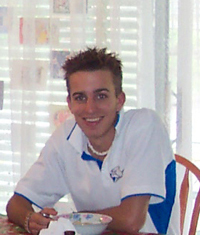 On 18 May 2006, my 18 year old son died by suicide. This left my family in despair. The pain is raw. The wounds are deep. We can only take one hour at a time in our journey through the grief and sorrow. I pray my words will help those who are suicidal to see that there are always other options available to them. The only step they have to take on their own is to talk to someone – anyone, even if it means they have to phone a complete stranger on a helpline. Once you get through this tough patch in your life, things will get better and at some stage in the future you will look back at this time and feel glad that you had the strength and courage to see it through. And, I hope survivors of other families who have suffered the loss of a loved one through suicide will find comfort and support in knowing that they are not alone in what they are feeling. I know I did. Whilst I am nowhere near this happening yet, I do realise that there will come a time when I no longer feel the need to continue with this blog. When I’ve said what needs to be said, I will stop posting, but the information will remain here in honour of Barry Andrew Henderson, my son. I also hope that the site will be a contribution to raising suicide awareness. Before I lost Barry I had no idea that suicide was taking so many of our children, I had no idea what the signs were, or how to help a teenager in need. I never believed that suicide would affect my family. This makes me wonder how many other parents are out there who have no idea about suicide also. To me, it is crucial that all parents know the facts and be aware of what is happening with our children and I feel the information found on this site will help with that. It’s been 10 months today since I lost Barry. Right now, my family and I are moving along this path called life in a easy, yet sad, way. Barry will never be forgotten. His smile and laugh will always echo in my mind, but at this moment we are surviving. I hope I can say the same thing in two months. Regular visitors will notice my posts are becoming less frequent. This is because I no longer feel turbulent inside. For three weeks I have slept well and this in turn has given me renewed energy and better focus. I believe soon after the first anniversary (for want of a better, more suitable word) this blog will come to an end. This will not signify an end to my love for Barry and it will not mean I no longer think of him, because I will never, ever forget him and I could never stop loving him. It will mean that it’s time to move on, forward. It will mean that I’ve said everything that needs to be said. It will also mean that I walk in the shadows of the light. Never completely whole again, but able to breath in the freshness of the air and feel the warmth of the sun close by. In the ten months since my last update, a lot has happened. I could never imagine a road so full of twists and turns, ups and downs…but we got through everything thrown at us and I feel confident we’ll continue to do so. In December 2007, I made the decision to let my surviving son live his life. I cannot live the rest of my life worrying and fretting every second of every day. It was making me sick to the core and I knew it would have shortened my time on Earth. My son will do what he wants to do. I have no control over that and, as a parent, I must let go and let him get on with it. It’s not easy, and it’s a constant struggle, but I feel more at ease since making that decision. I’m pushing on with my own life. But I’ve also discovered the need to rebuild. I no longer want the remnants of my old life, I want a new life and I find myself changing in a lot of ways. Different things hold my interest and my outlook on life has shifted altogether. I don’t know what the future holds for me and my family, but I’m ready to face whatever it is. As for this website…I have little more to say. The past is documented here. I have shared my journey in the hope it will help other people, but I also wrote my story to help myself. Some people will learn from my words, others will think them foolish and then there will be some who will read but will never truly understand what it means to loss a child to suicide. Make the most of today. Make it count. Build memories for those around you. Live. On 27 March 2014, my father told me he has lung cancer. Less than a month later, he told me that he has two months to live. And, to top it off, he tells me my mother has early dementia and will need ongoing care when he’s gone. My life has once again been turned upside-down. And, as before, I know I will find writing about it beneficial. So, I go from suicide to cancer; and no doubt there will be posts about caring for someone with dementia too. Again, I hope my words help others. But please remember they are specific for me, and may not relate to anyone else at all. But I will share them anyway.